I have a crush on the Australian textile design community. There is just so much talent here (just search for textiles on Bondville and you'll see what I mean). 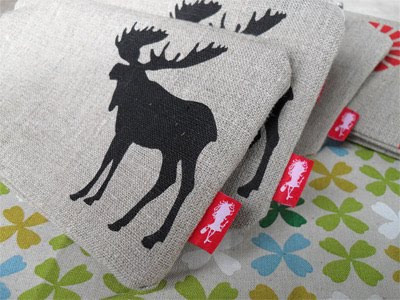 I recently found yet another great textile designer - Blue Ginger Designs - through the good folk over at greenolive design. Kylie Bickerdike is the lass behind the label and is based in Buninyong, Victoria. 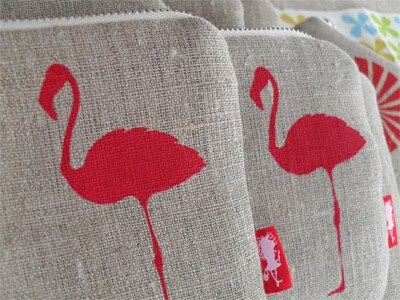 Her range of textiles is perfect for home decor and accessories. 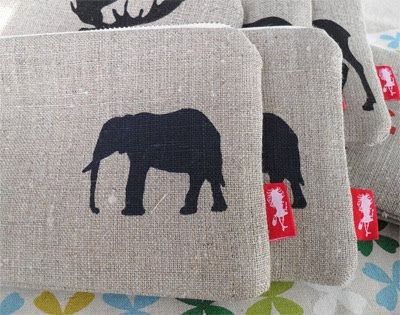 These animal-stamped linen purses are just gorgeous don't you think? And check out the amazing men's ties that Kylie has recently designed. They would be fantastic for groomsmen and a hip groom. You can find Blue Ginger Designs on Etsy and MadeIt (Australia). Check out more designs on the Blue Ginger Designs blog. Simply beautiful....I'll be looking her up.. These are SOOO gorgeous! I love them. I bought a book of stencils in the UK and was considering making something similar on canvas bags... doubt they'd look as good as this though. I love Kylie's work and she is is a really sweet person too! Hi Ali, Edwina and Allison, great to hear that Kylie's lovely in real life too. We have such clever bods in Australia!